Over a century, the business grew from a simple bookstore selling newspapers, a few kitabs (religious books) and some other books to a fully air-conditioned modern bookstore offering WiFi service. In the 1970s the bookstore was renamed Kedai Buku Ahmad Omar and later to Alam Akademik Sdn Bhd. My grandfather, Ahmad Omar bought the shophouse more than 30 years ago but was forced to surrender the land to the state government for only RM200, 000 (because of land acquisition)! Did we agree to such a low price for the freehold prime land right by the very main street of the town? Of course we did not; in fact my grandfather had never ever wanted to sell the shophouse for what ever price for the shophouse means so much to him. But what choice did he has when it came to land acquisition by the state government? 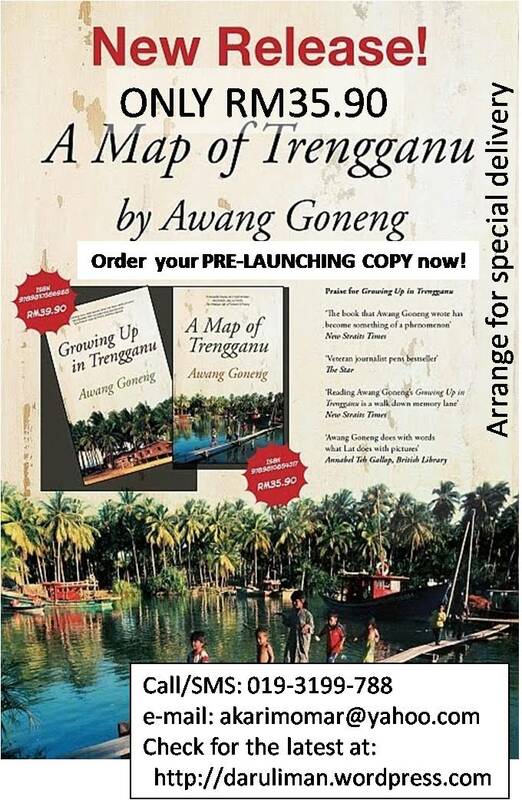 My grandparents complained the matter to the Terengganu Chief Minister (at the time), Tan Sri Wan Mokhtar Ahmad and he promised that the shophouses’ owners will be offered to buy new shophouses at a very special price (as part of the deal) to compensate our lost, as the RM200,000 paid to us was far below the market price at the time. He also promised us that the government will let us stay in the building until they provide us a new place in the area. Trusting that Tan Sri Wan Mokhtar’s words as official promises by the Terengganu state government, my grandfather did not make any further official complain. Furthermore as a strong UMNO supporter, my grandfather trusted the Barisan Nasional state government fully and never ever imagine that UMNO will disown their promises even though it was not made on paper! My grandfather used to work overseas for the first Malaysian Prime Minister YM Tunku Abdul Rahman Putra Al-Haj as a diplomat with minister’s status and later joined the politics as a state assemblyman and also as the political secretary to the (then) Chief Minister, Tan Sri Ibrahim Fikri. And for the sake of UMNO my grandfather had no choice but to accept the offer without making a legal complain. 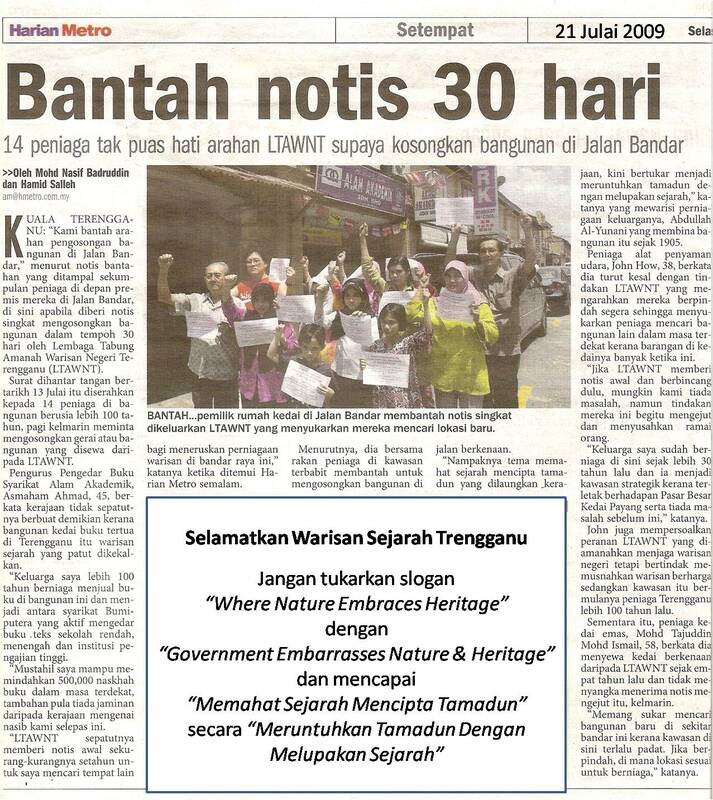 On the 19th July, 2009, 34 shopkeepers in Jalan Bandar and Jalan Banggol, Kuala Terengganu (including Alam Akademik) received a notice from the Lembaga Tabung Amanah Warisan Negari Terengganu to vacate the shophouses before 13th August, 2009. [Read about it in my previous posting here] When we questioned the notice and the promises made by the state government years ago at the time we were forced to surrender our land to the state government for a mere RM200,000; they said that they are not responsible of providing us a place to move to and have the right to force us out since the land is now theirs. What happened to all of the sweet promises they made before? The sad news was that the LTAWNT or the ‘supposedly’ heritage board of the state of Terengganu is planning to demolish the heritage row to widen the road and to build new building in the name of modernisation. Isn’t it odd that the heritage board do not seems to understand the value of heritage? When the other states of Malaysia such as Melaka, Pulau Pinang (Penang) and the Federal Territory of Kuala Lumpur are proud to restore their heritage buildings, the Terengganu heritage board looked at the heritage building as an eye sore. How sad…..Who can we trust to protect our heritage then? The heritage row is still standing strong and beautiful; and still fit for business. And what about the historical value of the building? The Terengganu state government had already destroyed lots of heritage historical buildings to make way for new buildings. They claimed that they are building a modern ‘city’ and they do not want ‘old and shabby’ buildings in the city of Terengganu. If they are trying to say that the shophouses looked old and shabby, think again. It does NOT look shabby at all, in fact its quality is even better than the new ‘modern’ buildings which are facing problems (including those that collapsed) as we can see day after day. The state government should instead use the fund to restore and beautify the heritage row and protect the heritage historical building for its invaluable historical value to the people of Terengganu. “He is a coward” said one of the shopowners during the many protests held. “Is he afraid of what people may think of him? He knew it was wrong of him to do what he is doing but who cares? He’ll get the money and it’s not him who will suffer… it’s us“. To all those out there who care enough for the heritage and history, please help us to preserve the place. You could ask help from organisations, NGOs or perhaps inform this to a person you know. The least you can do is perhaps to write about it and spread the message. You’ll never know how powerful words can be.